This BLOG-like page is being generated in a form similar to previous ETS ones to document and provide information on a Northern Washington ETS that should start sometime between April and May, 2018. There are no special experiments in the field for this ETS. We will be tracking and reporting on this ETS using data only from the real-time regional networks (UW, UO, CN, TA, PB, CA) and/or information reported to us by others. Information will be posted on this page (latest at the bottom) and references to figures from time to time. March 23, 2018 - The next expected main Washington - British Columbia ETS should start sometime in April or May based on the roughly 14 month repeat period observed since around 2000. The previous one started on Feb 18, 2017 and ended on April 6 but had a two week hiatus in the middle. I am not sure if the extended "start-stop-start" nature of the last ETS will make any difference in the start time for the next but I will stick my neck out and say it will start before June 1, 2018. In the meantime to make sure the wech-o-meter is ready we have gone through all the configurations to make sure that the best combination of working stations are being used. We are ready! Let err rip. May 12, 2018 - I usually wait for a full week of tremor before declaring the start of an ETS. However, so many of my previous predictions of what would happen have been wrong. I am used to it and so will take a chance and declare this ETS started as of May 8, 2018, after only four days of tremor. This one seems to be classic, starting only slightly north of where many in the past have started. There appears to be a subtle migration up dip, which is typical, and it is pretty close to right on schedule. Thus I am assuming we are off and running. It is way too early for any obvious geodetic signal to have started but will keep an eye on the typical set of stations to see when that signal can be spotted. Stay tuned. May 19, 2018 - We are now 10+ days into this ETS and it seems to be developing similar to many of the previous events, particularly those from 2007 - 2011. Over the past couple of days tremor first spread slightly to the north and then to the south. Here is a snapshot of the first 10 days of this ETS color coded by time (blue early, red late). 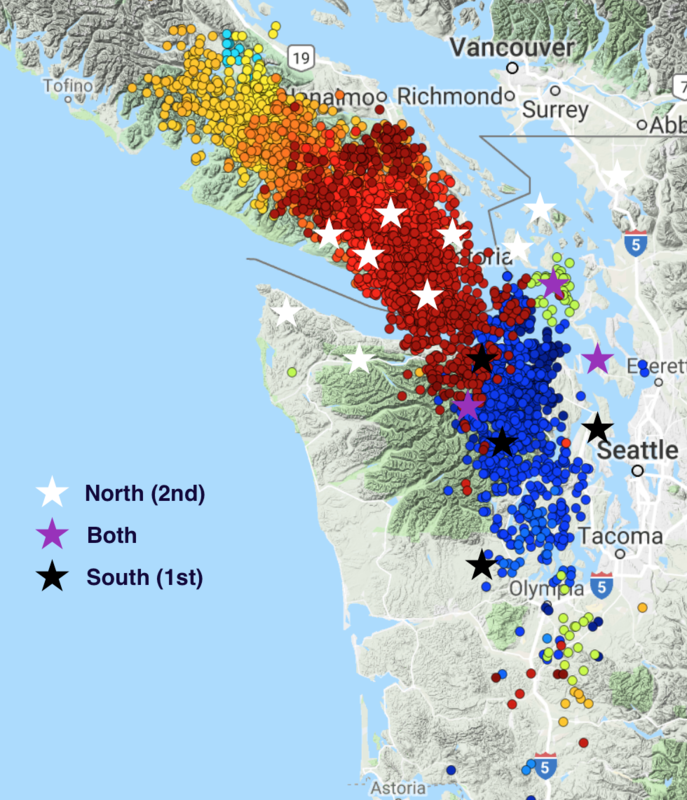 Be aware that the early (blue to yellow) events south of Olympia are probably due to glitches in the data and are not real tremor locations. We have since reconfigured the system to not use the glitchy stations causing these false locations. We expect this ETS to continue for at least another two to three weeks spreading a bit farther south but quite a bit more to the north. Thus far I (a seismologist) don't see any evidence of geodetic slip in the GPS data provided by PANGA. You can looked for yourself at the Central Washington University PANGA web page. May 29, 2018 - Me and my big mouth. No sooner had I predicted what would happen then the whole thing sputtered out. The last day of obvious ETS-like tremor took place on May 23. There were a few minor events located on May 25 in the south Puget Sound but nothing like what would be expected for a full blown ETS. Maybe it is just a pause. Maybe this one is a dud. Maybe the world will come to an end. Who knows at this point. One thing is for sure. ETS patterns have some very general things that seem to be predictable but in detail they are all over the place. I will not even try to predict what might happen next. OK, yes I will. I think that within a week it will start up again somewhere, likely in the northern Olympics but it could be in South Puget Sound or up on Vancouver Island or no where at all. Yep, some prediction. Oh well. For those of you who have been watching the wech-o-meter in detail you are probably saying things like "Oh my gosh, the northern end of Vancouver Island is going to fall off". Nope, the strange line of events showing up on the past few day's plots heading north-east onto the mainland are total artifacts of some telemetry glitches coming from 4 Canadian seismic stations. Starting on May 25 it seems there are LOTS of gaps from these stations for an unknown reason. These gaps conspire to fool the wech-o-meter into thinking there are bursts of tremor taking place here. Looking at the original data it is obvious that is not the case. We are working with the Canadian seismic network people to try and get this fixed. However, we will remove these totally bogus events from our tremor catalog so as to not confuse people.... and ourselves when we look at it in the future and forget that it is just garbage. Thus, at the risk of providing fodder to the whack-o conspiracy theorists using this as proof that aliens from planet zeeoxeon have abducted tremor events, we will fess up right here and now that we be the aliens and have deleted, removed, terminated said offensive garbage from our catalog. We will also be removing the offending Canadian stations from our wech-o-meter configurations until they get fixed. June 21, 2018 - What a strange ETS! Of course, because I said that it would restart back in late May the area stayed ridiculously quiet up until a few days ago. 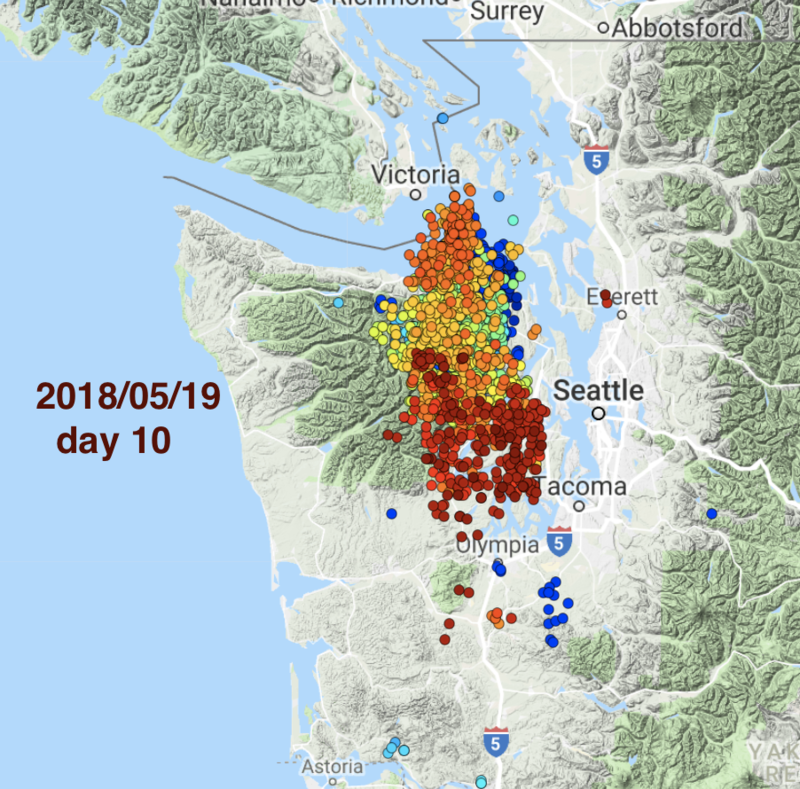 Other than some down-dip pipsqueaks on May 31 and June 14 there have been virtually no tremor locations in northern Cascadia for most of a month. This is not the way a traditional ETS should go. But, why stick with tradition? On June 18 typical ETS type tremor started up again in south-central Vancouver Island. Maybe this is finally the continuation of the standard ETS. But maybe it is a separate one that will now head north. It is filling in nicely today. Thus, while I have been warned many time to not declare a real ETS underway until there is at least a week to 10 days of solid tremor I am going to throw caution to the wind and say "it is going again.... or some more". Perhaps I could be talked into calling this "restart" a "separate" ETS. For several ETS events in a row activity stretched from central Vancouver Island to southern Puget Sound, sometimes progressing north, sometimes south and sometimes jumping around a bit. The last ETS ran for a while in Puget Sound and then took a two week break after which it continued on Vancouver Island. The one this year seems to be doing sort of the same but with a four week break. Is there a pattern here? Is the standard cross-border ETS now be breaking into two separate ones unrelated to each other? Can we blame this fracturing of the cooperative US-Canadian ETS events of the past on the fracturing political cooperation or, perhaps the other way around. I will wait to see what additional surprises are thrown our way before delving more deeply into cause and effect. June 25, 2018 - For once my "prediction" of what the tremor would do has turned out to be correct.... sort of. Now, a week in to this tremor period it is still going strongly, first spreading both north and south but in the past couple of days only slowly progressing to the south. Thus, if you switch my suggestion of a northern progression to a southern one, I was correct. I'll take this as good omen that I am on to something and will proceed bravely with the next prediction. I think it will continue progressing to the south until it fills the gap between the Puget Sound ETS of last month and where it is now. The previous one got to just about the middle of the Straits of Juan de Fuca, which means that to close this gap should take about another week to ten days. There you have it. Wild prediction number next... that will certainly pan out. 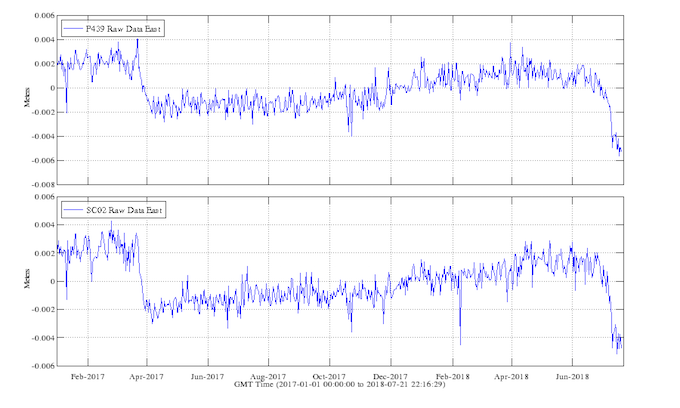 Just to convince you that the tremor period of last month (May 8 -23) was an honest to god "Slip" event I show below a series of displacement plots from GPS stations in the western Puget Sound region. Station "SEDR" is at the northern end and "KTBW" near the southern end. The displacements during this ETS seem to be of a similar size to those in Jan. 2017 but took place more quickly. Of course this blabbering is from a seismologist, not a geodesist so take them as interesting with a grain of salt. By the way, my previous speculation that the separation of the cross border ETS into a separate Canadian one and US one because of international political "differences" has been picked up by at least one correspondent who thinks it may be worth pursuing this topic further and branching into other tremor/tariffs/tweet-storm relationships. I am all for it. July 5, 2018 - OK, so I am off on the time it will take to fill in the gap. BUT, it looks as if gap-filling is what is going on. The Vancouver Island tremor events continue to slowly drift south and are now approaching the international border. It is now 10 days since I predicted it would take 7 - 10 days to fill the gap, and it is going to take longer. Professor Wech (of the famous Wech-o-Meter) sent me a note that he thinks it will go for five more days to fill the gap. But, what does he know? He is just a specialist in this sort of thing. Our own ETS researcher, Prof K. Creager makes some interesting comments as well: "Back in the day, these ETS events were mostly simple. Start at one place and propagate outward in one or both directions along strike. Many of the more recent events have started a distant places and migrated towards the center. What does that mean??? Is there some slow slip event deeper, and invisible to us, that is initiating slip at distant places?" I have also received a "compelling question" from the PNSN head honcho, Professor, Dr. P. Bodin, "To what extent is the evolutionary path of slow slip events “predictable” when one is observed to begin?" He is obviously not aware of my many futile attempts over the years to do just that. Another, interesting note I received from a self described "rank amateur who shouldn't be practicing geology at home" (J. McBride) noticed that the number of tremor events detected in the recent Vancouver Island segment is 3.5 times as many as all the events in the Puget Sound segment of a month ago. He speculates that the current sequence may actually "immigrate" across the border and help the American segment be everything it should be. While he is not betting on this, I am considering putting down some money that he is right. Time will tell if us professionals have anything over the "rank amateur home-body geologist". July 18, 2018 - What a strange ETS.... or maybe two ETS events separated by a month but covering an area often taken up by one ETS. In any case it is finally over. I am thinking that the real thing was over on July 11 or 12, but bits of weak tremor continued here and there until July 15 when the whole zone went quiet for at least two whole days. Typically one considers an ETS to be one period of several weeks when there is relatively strong tremor every day as it progresses uniformly along strike at about 10-15 km/day. This event only followed that pattern part of the time. Sometimes it would jump big distances and end up with tremor on both ends of a zone. Both before and after the main event there were smaller patches of relatively weak tremor, usually on the down-dip edge but other times on the far up-dip edge. While tremor patterns seemed comparatively uniform for some of the past events (2007 - 2012) since then it seems the complexity has increased. I have been maintaining two sets of summary plots for all past tremor events. Check out The tremor density plot that gives a contoured image of the number of events for an entire ETS event. With far more detail and complexity is the tremor locations by week plot that shows via colors the time progression of tremor during each week of an episode. Time increases from blue to red so one can tell the progression of tremor over time for each week. 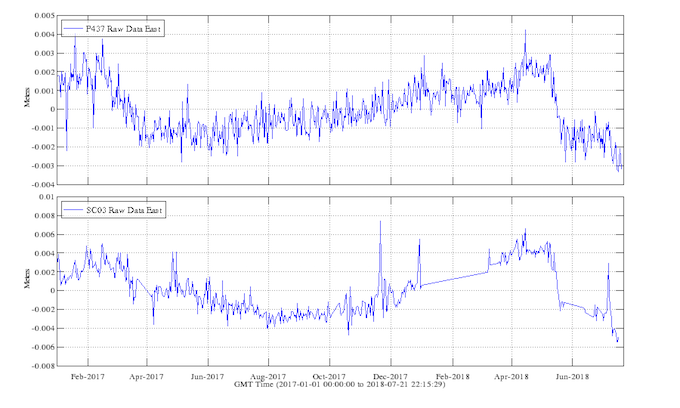 The last two events have had pauses of two weeks and over a month respectively so that the total number of weeks of the events were greater than any previous event; however, the total time that tremor was active is not that much different. Keep in mind that these summaries are ONLY for what I call the main ETS zone, from central Puget Sound north through Central Vancouver Island. Both north and south of this "main" zone there are other patches of Cascadia that have their own unique tremor pattern. In particular the central Oregon area has strong tremor but not nearly as frequently and the California zone has frequent but shorter lived ETS events. 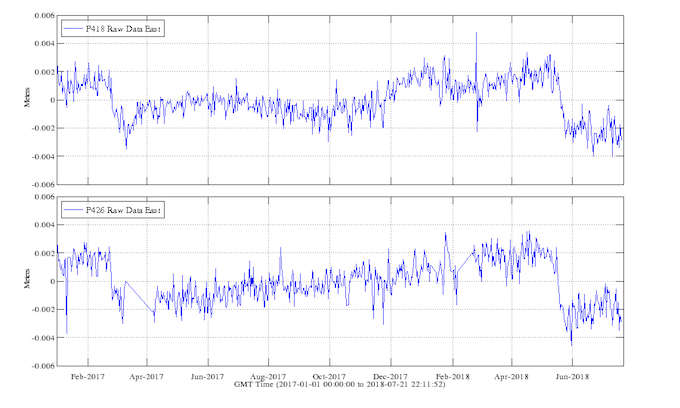 For a great comparison of tremor all along Cascadia see Aaron Wech's blog post of a couple of years ago on a perspective on tremor activity. I will add one more entry to this blog in a few days to cover some observations of the geodetic data. Of course if a "real" geodesist wants to chime in with thoughts I am happy to include those comments and give full credit. Otherwise, this seismologist will probably make a fool of himself arm waving about the geodetic data available online. July 21, 2018 - There is now no doubt that this ETS is over; no tremor in almost a week. Not only that but the geodetic offsets at most of the relevant GPS stations with good data seem to show the end of the event. Searching all of the available data on the PANGA site one can find many stations with obvious off-sets. Some of these started near the end of May and others at the end of July, just as the tremor was divided into two separate sets. Here is a map with the tremor locations color coded by time, The earlier period in blue and the later period in yellow to red. I have also plotted several GPS stations as stars color coded by those showing off-sets starting in May (black) and starting in June (white). Those that seem to have two different off-sets in both May and June I show in purple. 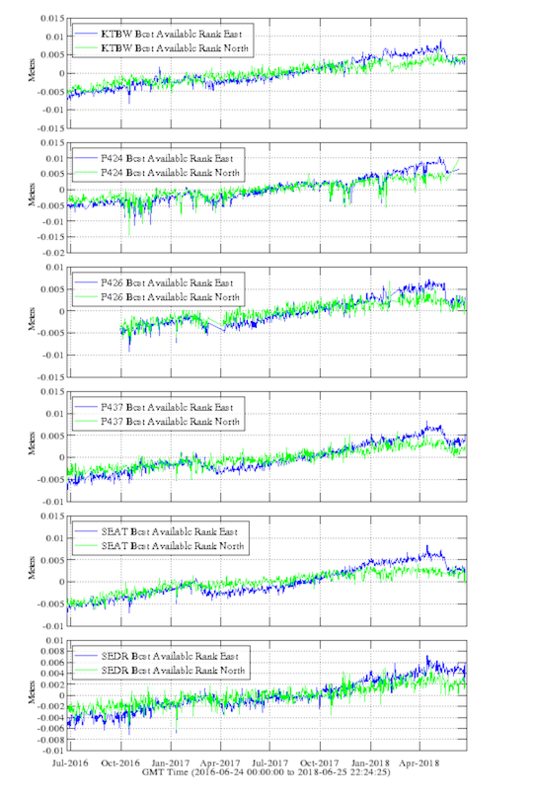 Example time series for two stations in each group are shown below. The earlier set in the south is shown first followed by two stations that show both sequences followed by two that are only in the north. As GPS data are received, processed and made available (which can take weeks after current time) one may find other stations with similar or even larger signals. Not being a geodesist, I am want to try and interpret the details of these data but even a seismologist can tell that this ETS event was separated into two different parts (or two different events) that overlapped at about the international border. Now for a long distance prediction. My guess (which is worth only about a dime) is that the next main ETS will take place in two even more separate batches. There will be a Puget Sound ETS followed maybe months later by a Vancouver Island ETS. Right?